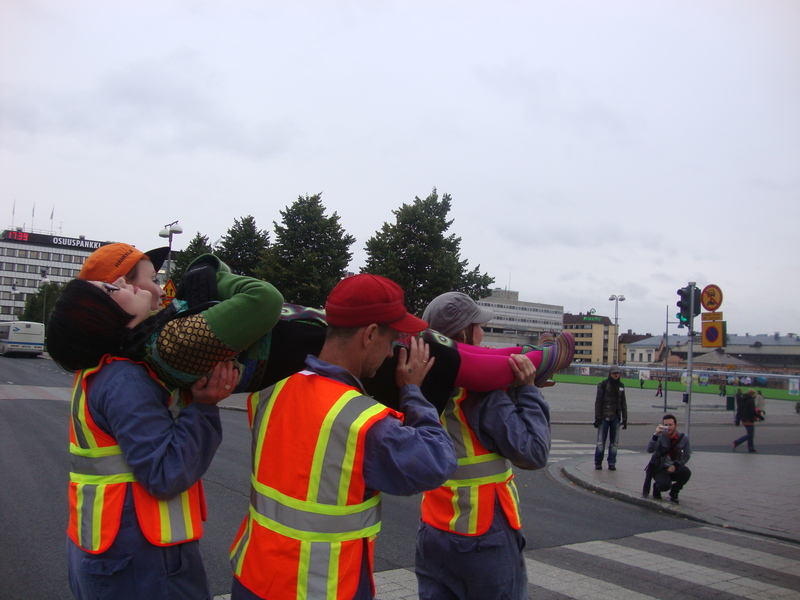 In Assisted Street Crossing pedestrians are offered a lift (literally) across the street by TYRSTers costumed as non-specific city workers. They are invited to choose from a menu (see below). 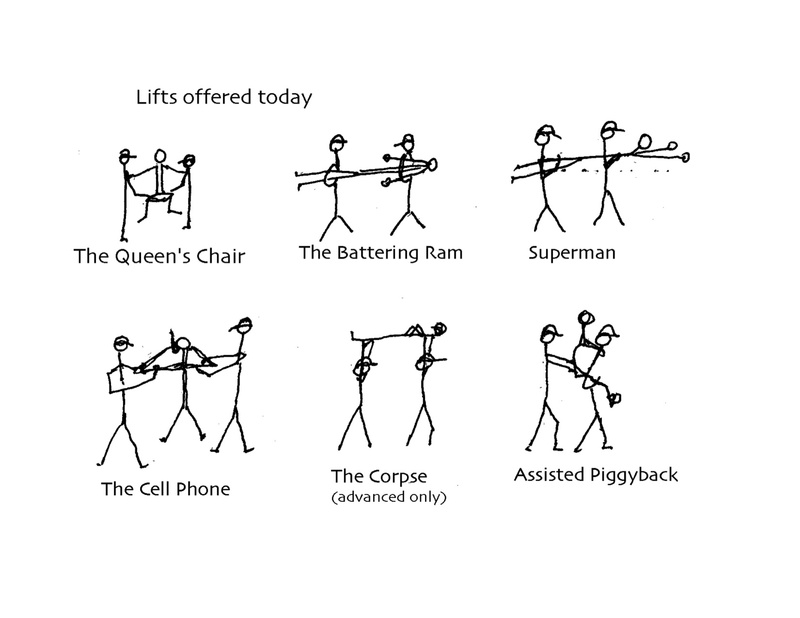 Some popular lifts include the Superman, the Queen’s Chair, the Battering Ram, and, the daredevil’s favorite, the Corpse. Assisted Street Crossing is the signature piece of TRYST, and has been “performed” on E. 10th St., in the Wall St. area, and on the Upper East Side in Manhattan, in Peekskill, NY, in Brooklyn as part of the DUMBO Arts Festival, in Kuopio, Finland as part of the ANTI Contemporary Art Festival, and in Montemor-o-Novo, Portugal as part of the Generative Indirections conference. The version shown in the video was “performed” Fridays, July 9, 15, 21 & 28, 2004, 4:30-6 PM, on the corner of Broad St. and Water St. in Manhattan, with lifters Paul Benney, Clarinda Mac Low, Janusz Jaworski, Robert Meyer, Aki Sasamoto, Arturo Vidich, and Kathy Westwater. 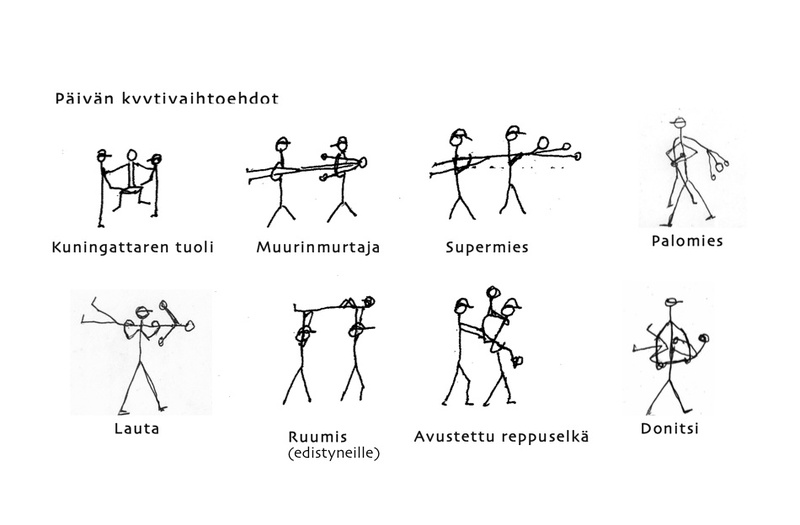 The photos show documentation of the version “performed” in Kuopio, using local Finnish lifters. 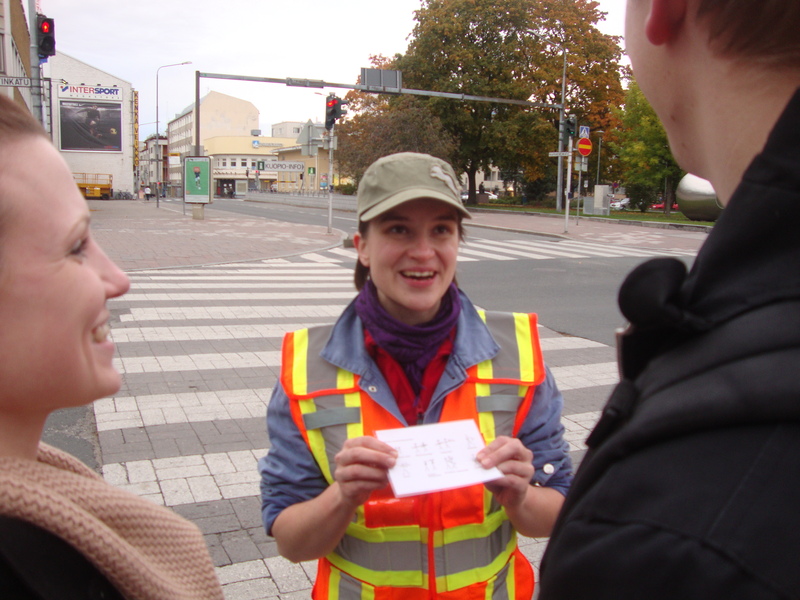 Assisted Street Crossing: Kuopio was performed on three different street corners throughout the city on four successive days as part of the ANTI Festival in Oct. 2011.